Update on Sept. 18 — Social Media Week Fairfax has been rescheduled for Oct. 18. The uncertainty of Hurricane Florence’s path has led to Social Media Week Fairfax being postponed. The event, originally scheduled for Friday (Sept. 14) in Tyson’s Capital One Auditorium, is a one-day forum on how social media and technology are influencing society. Tickets purchased for the event will be valid for whichever date the event is rescheduled for. The hurricane — currently a Category 3 storm — is expected to make landfall Thursday night. 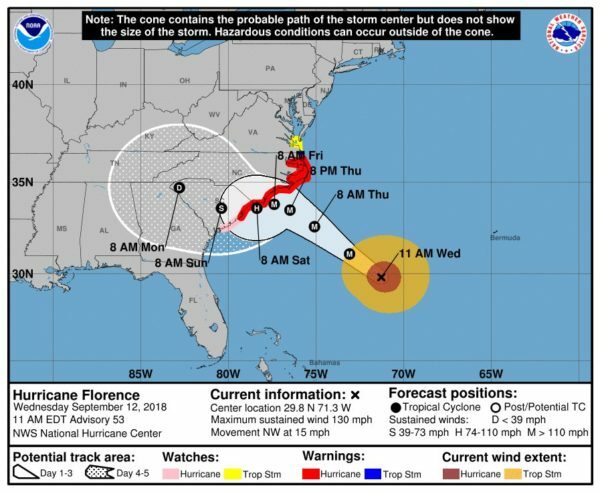 While the projected route will have North and South Carolina taking the brunt of the impact, substantial wind and rainfall is still expected in parts of Virginia. The storm is expected to bring 2-4 inches of rain locally with the potential for flooding over the weekend. The impact of the flooding could continue into next week as floodwaters make their way southeast across Fairfax County, according to the county government. Tomorrow’s Virginia Department of Transportation (VDOT) meeting to discuss congestion solutions in McLean, meanwhile, has been cancelled. Supervisor John Foust said the meeting was cancelled partially because of the weather risk and partially to allow VDOT to focus its effort on storm-related transportation issues. The meeting will be rescheduled.